Andreas Bachmair is a classical homeopathic practitioner from Germany who performed a comparative analysis of health among a large number of children both vaccinated and unvaccinated. He decided to conduct his self-funded study after noticing an increasing number of patients in his practice who had been damaged by vaccines. If it was discovered in his research that vaccinated children were less healthy than unvaccinated, the implications would mean healthier people and less vaccine-damaged patients for him to treat in his clinic, indicating that there was no conflict of interest or profit motive for him to reach the conclusions that he did. According to Bachmair, three other studies independent of this one had similar results. The research began by collecting data from the parents of vaccine-free children through an online questionairre on vaccineinjury.info, and included 8000 individual cases, all of which included medical documentation. After gathering and verifying the data, researchers compared it to the German KIGGS health study of children within the general population and discovered their startling results detailed in the graph below. No Studies Like this in America? The results revealed by this German study constitute enough evidence to halt all childhood vaccinations in Germany permanently, and this would likely happen in a world uncorrupted by the enormous profit motives of the vaccine industry. 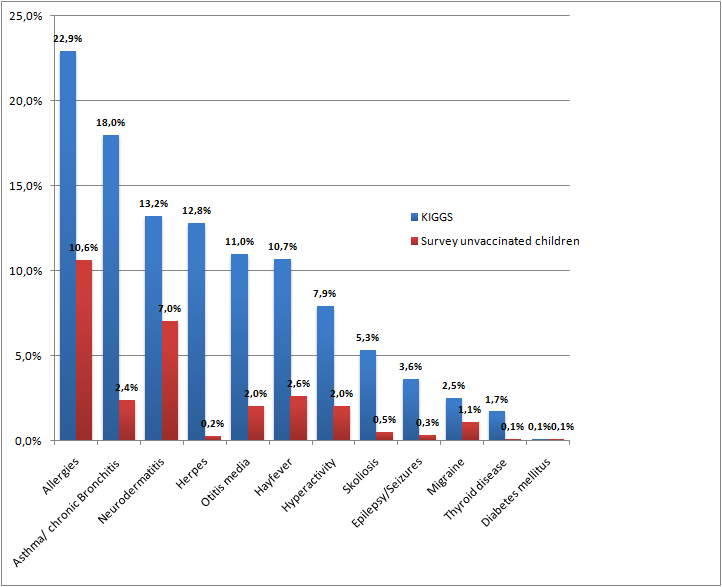 In the United States currently, over 50 doses of over 14 different vaccines are given to children before kindergarten, and no studies have ever been conducted by the CDC or similar health agencies to compare the health of children exposed to vaccines vs those who have remained vaccine-free. Instead, what we see are aggressive governmental campaigns to promote more vaccination, and to attack and discredit those who choose to question the theory. What can be said of the very clear, unbiased findings of Andreas Bachmair’s independently-funded study? It can be said that of the 8000 children who participated in the study and had previously been vaccinated, their health was damaged significantly by the vaccines they had received. “Every vaccine produces harm,” was the conclusion of Canadian researcher Dr. Andrew Moulden, before he died suspiciously in November, 2013. Ultimately, it’s up to you to decide if you want to vaccinate yourself, and your children, and I hope this study is taken into consideration before making that decision. As for me, if I ever have children, I can say with certainty that they will not be receiving any vaccinations, ever.